On December 23, jazz vocalists sang together in the Christmas concert of the Okinawa Jazz Association at the Naha Civic Hall. 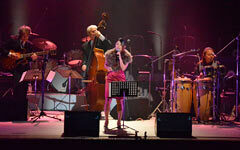 On December 23, the Okinawa Jazz Association held a Christmas concert at the Naha Civic Hall. This is the first part of a series focusing on jazz vocalists. The OJA Jazz Orchestra and COCKTAIL played various songs, including several jazz standards. Takako Afuso, Ryoji Tokito and other singers sang on the stage with their deep voices.